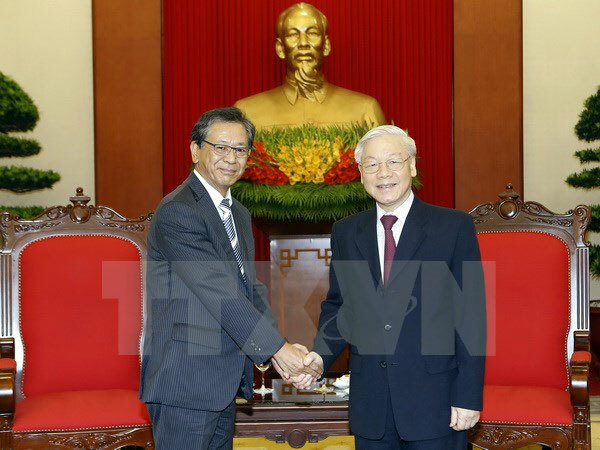 Party Secretary General Nguyen Phu Trong has hailed outgoing Japanese Ambassador Hiroshi Fukada for his positive contributions to deepening the bilateral extensive strategic partnership during his tenure in Vietnam. Party Secretary General Nguyen Phu Trong (R) ​and Japanese Ambassador Hiroshi Fukada (Photo: VNA). During a reception in Hanoi on October 7, Mr. Nguyen Phu Trong expressed his delight at the strong and practical development of Vietnam-Japan ties in multiple areas, especially since the two countries’ leaders issued a Joint Vision Statement on bilateral relations on the occasion of the Vietnamese Party General Secretary’s visit to Japan in September 2015. The Vietnamese Party and State always consider Japan a long-term and top important partner, he stressed. The host expressed hope that in any position, the ambassador will further contribute to promoting bilateral ties. Mr. Fukada, for his part, expressed wish to continue strengthening all-around ties with Vietnam, including facilitating high-level visits, and increasing coordination in regional and global issues. He pledged to do his best to reinforce ties between the two countries as well as people-to-people exchange./.